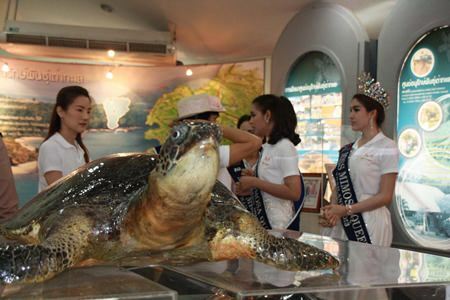 Top finishers in November’s Miss Mimosa Queen transvestite beauty pageant made merit by releasing sea turtles into the wild in Sattahip. 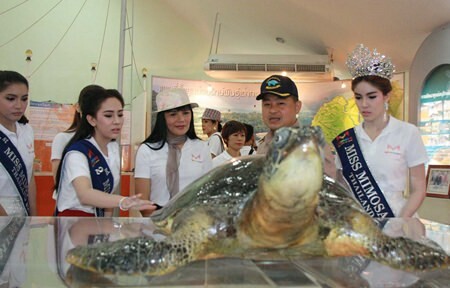 Mimosa Managing Director Jirachot Kaewsathien led winner Nisamanee Lertwonpong, 22, a student from Srinakharinwirot University, and runners-up Pachonwan Khantipinyo, 19, and Pattarawarin Bunprasert, 22, to the Royal Thai Navy’s Sea Turtle Conservation Center Jan. 31. Jirachot shelter director Boonchoo Muangmaithong that the transvestites, by winning the pageant, had improved their position in life and that he encouraged them to do work on behalf of society. 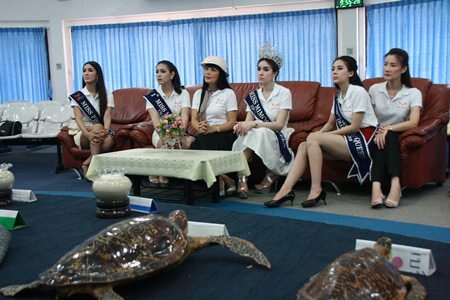 Top finishers in November’s Miss Mimosa Queen transvestite beauty pageant make merit by releasing sea turtles into the wild. 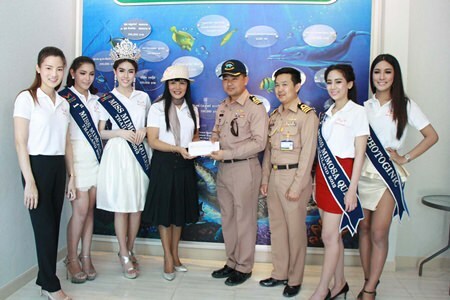 The contestants released 6 turtles raised at the center into the sea and presented Adm. Luechai Ruddit with 10,000 baht for turtle food. The Nov. 14-17 Miss Mimosa pageant featured Thai transvestites and transsexuals new to beauty pageants, banning winners or second-place finishers in the established Miss Tiffany and Alcazar Beauties pageants from participating. Contestants had to be Thai men 18-30 years of age, unsigned to any modeling or sponsorship contract, drug-free and good English speakers.